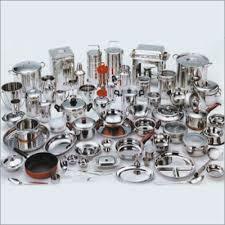 We are engaged in supplying and exporting a wide range of Stainless Steel Utensils. 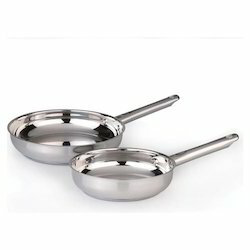 We offer entire range of Cookware that is demanded widely due to its unique features like elegant designs, safety handles for easy handling, fine mirror finish, classy look, perfect matte finish, and metallic colors. 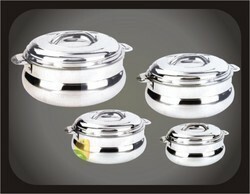 As an eminent enterprise in the domain, we hold specialization in offering our clients a qualitative Emperor Dish Set. 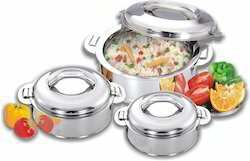 The offered dish set is widely acclaimed in both national and international market for featuring various attributes. 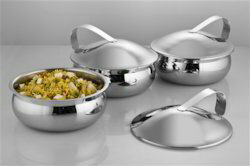 In tandem with the current market trends, our offered dish set is precisely designed using premium quality raw material and leading edge technology. 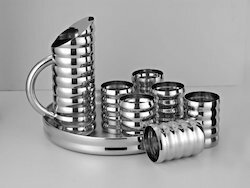 Additionally, we offer these dish set to our customers after assuring that our offered range is the best in quality and design. Backed by the support of our experienced professionals in this domain, we have been able to bring forward a qualitative range of Steel Cutlery. 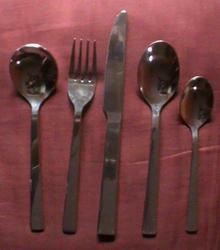 The provided cutlery is manufactured by vendor’s adept workforce using the best grade basic material and stainless steel. Offered cutlery is widely acknowledged by our clients for its exquisite design, fine finish and enchanting look. Moreover, our clients can avail this cutlery at most affordable price. Keeping in mind the diverse requirements of our clients, we are engaged in exporting, trading, importing & supplying wide array of Household Utensil Products. These house hold utensils are highly demanded by the customers owing to their qualitative attributes like eye-catching design, impeccable finish, and crack resistance etc. 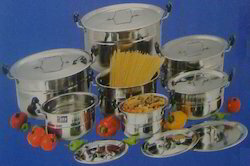 The products ranges of household utensils are briyani pot, steel mug, promotional water bottles, stainless steel, sugar bowl etc. The provided product is designed with utmost precision in order to add charm and elegance to the kitchen. 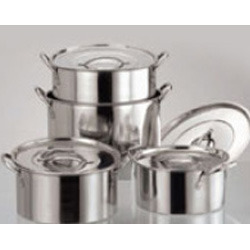 With rich industry experience and knowledge, we are engaged in offering a wide range of Stock Pot. These products are manufactured by the professionals using premium quality stainless steel in conformation with the international standards. The offered stock pot is used for making soups and cook pasta. 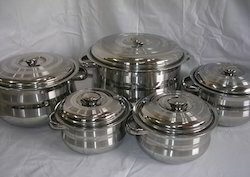 In addition, these pots have round base, deep straight sides and cover for perfect cooking. We have positioned ourselves as a leading trader, importer, exporter and supplier of superior quality Shallow Pot. The offered pot is appreciated by our clients in the national as well as international markets. 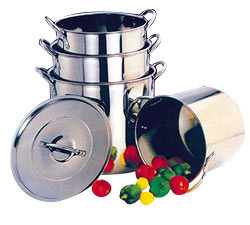 The offered pots are designed from top notch material & contemporary techniques in compliance with the set norms of industry. These shallow pots are widely acknowledged by our clients for their easy cleaning.